The dry goods store established by Rowland H. Macy in 1858 at 14th Street and Sixth Avenue was in the hub of the shopping district. But by the 1880's large, impressive emporiums were establishing themselves further up Sixth Avenue along what would be called The Ladies Mile. Roland Macy had died in 1877 and in 185 brothers Isidor and Nathan Straus acquired the business. Realizing that the continued northward movement would leave his store behind and as the century wound down, they schemed to jump ahead of the pack, secretly buying up the properties along Broadway from 34th to 35th Streets. A handshake with Alfred Duane Pell cemented a $250,000 agreement for the 34th Street corner property. Henry Siegel, part owner of a major competitive dry goods concern, Siegel-Cooper, got wind of the plan. Through an agent he outbid Macy's for the corner lot by $125,000 and understandably Pell accepted--the difference was a substantial $3.8 million by today's standards. 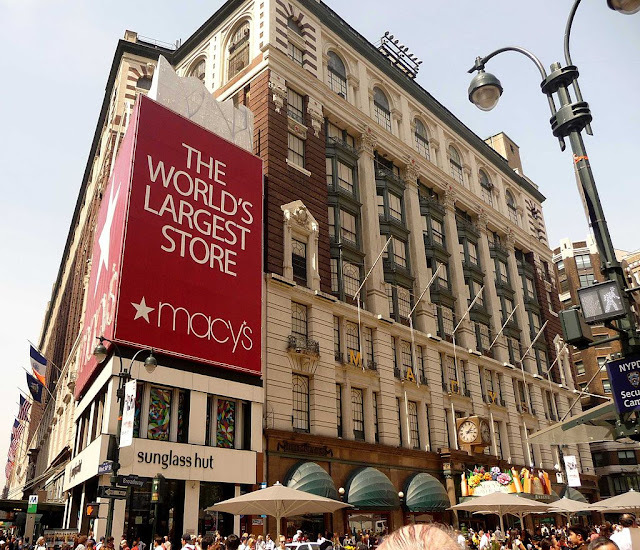 Although Siegel's intentions cannot be completely certain, it appears he wanted Macy's 14th Street property. He held the 34th Street corner hostage; the ransom being the 14th Street property. The Strausses called Siegel's bluff. 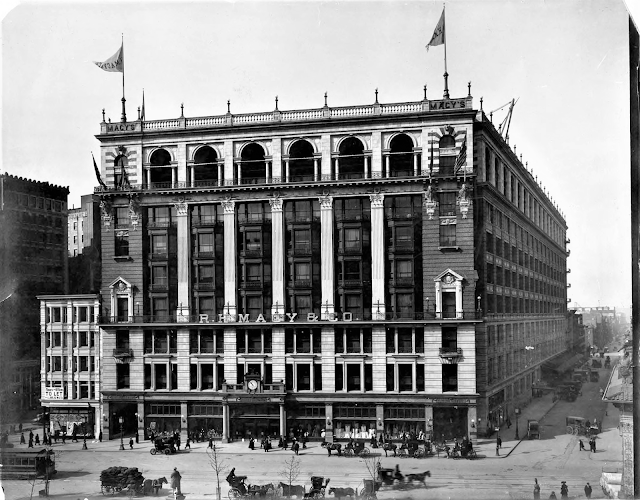 In July of 1901 it was announced that that Macy's would built a gigantic new store with over 1.5 million square feet, nine stories high, a commercial phenomenon. The structure would be built around the obstinate corner; a notable example of a real estate holdout. Defeated, Siegel razed his little corner building and erected a five-story commercial structure. In the meantime, the former Macy store on 14th Street remained vacant until 1903 when Siegel finally took it over. Four years later he sold his interest in the 34th Street building to Robert Smith who resold it in 1911 for $1 million--more than 27 times that much today. 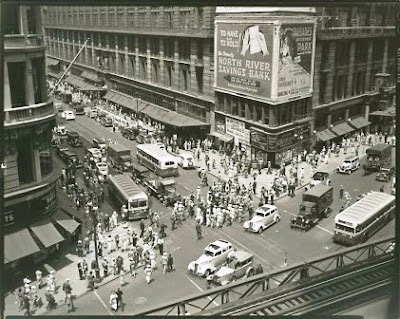 In the 1940's Macy's began using the little building as a backing for its advertising in what must have been an "if you can't beat it, use it" philosophy. As the decades progressed, less and less of the little building, designed by William H. Hume, was visible. Today just two floors of the Hume building can be seen under the huge red Macy's shopping bag that has become so familiar to New Yorkers. The David and the Goliath of the 34th Street corner have made peace, it would seem, after a century of irritating co-existence. No way 2 million pedestrians pass every day. That would be 83,000 every hour for 24 hours (including night). That number doesn't sound unbelievable. 2 million UNIQUE pedestrians seems less likely. Rowland Macy died in 1877, 2 years after taking on business partners who died in the following two years. Ownership passed through family until 1986 when R. H. Macy & Co. was acquired by the Straus brothers. There's otherwise truth to this story, though, even if the "spiteful Macy" is a bit of a tall tale. Absolutely right (except the Strauss brothers took it over in 1895, not 1986). This was a very old post which needed much revision. Thanks for pointing out the error. Madison Avenue circa 1910. I love this shot.